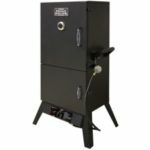 If you are one the folks who decided to choose a smoker for your weekend or holiday enjoyment and wish to slow-cook your meats, veggies and other foods using propane then this page will be of benefit to you, especially if your looking for the best propane smokers money can buy for 2019 and of course that is within your budget. They are definitely the choice for many people who prefer that smokey flavor and pork that seems to just pull-apart with perfection. There are few choices of power sources one can choose to heat up the smoker; such as charcoal, propane or electricity. 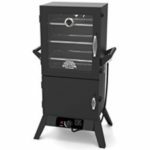 They all have their pros and cons, but for this page we will list and discuss the top-rated propane (LP) gas smokers that you’ll be pleased with. Take a look below and find one that suits you. 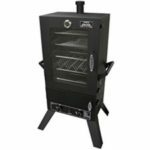 This Smoke Hollow smoker model 44241GW is for those who like to smoke lots and lots of meat, fruit or whatever floats your boat! 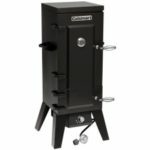 It is similar to the model above however is quite a bit larger boasting about 6.5 cubic feet of smoking space – easily enough for a large cookout or family gathering. You’ll get 7 cooking grids; 4 for regular smoking, 2 for smoking Jerky, 1 Rib rack and 1 Sausage hanger. 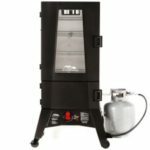 This unit also has a Tempered glass viewing window so you can keep an eye on those smoked goodies, a large porcelain coated water pan, 2 porcelain wood chip pans and a temperature gauge. What about output? This unit has two (2) 12,000 BTU stainless steel burners which you can run independently for optimum temperature control and performance. Click here to read more about this Smoke Hollow appliance and see if it’s a fit for you.